Whether you are looking for the cheapest VR Headset to buy, the most compatible with PC or mobile, or the one with the best possible interface, VR Tips today got you covered. While I was researching to get this guide “Top VR Headsets of 2018”, I was skeptical because I spent several weeks trying to research and hear from other sources that are conversant with some of the vr headsets we are going to be looking at today, this was done to ensure that VR Tips today produces the best resource and guide anyone can find on the internet concerning vr headsets, because after understanding what VR is all about your next question would be which VR headset is the best? If you are a VR nerd like me you may be needing a headset with high graphics resolution, even though you might be conversant with Oculus Rift, HTC Vive and even PlayStation VR, there’s still more to discuss other than the ones mentioned. 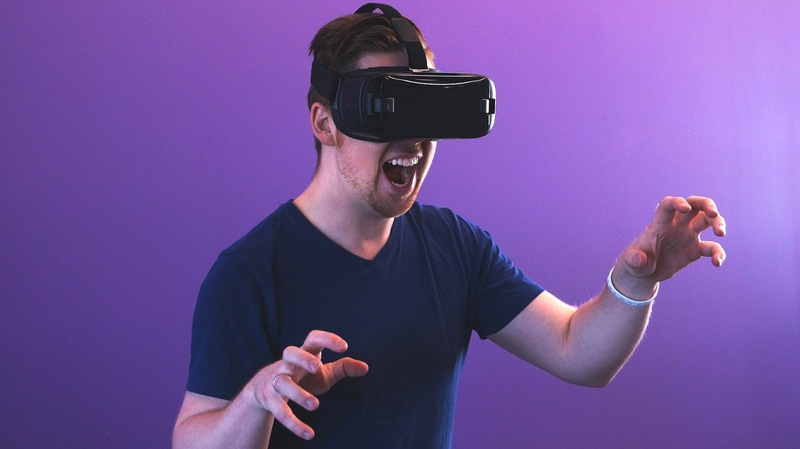 In no particular order, here is a comprehensive list of top VR Headset of 2018 by VR Tips Today. It’s no doubt that almost everyone owns a smartphone, which makes it possible for the mobile VR to thrive. The mobile vr constitutes VR headset which uses a smartphone as a processing and display unit. The Google cardboard VR Headset was built to be compatible with any smartphone and as its name implies when Google is taken out, it’s now left as a VR headset made using the cardboard we are all familiar with used in packaging new goodies. Google cardboard works using two lenses, placed in front of a user’s eyes which, when combined with VR enabled apps, allows you to have a feel of what your smartphone is displaying in an immersive and responsive 3D environment. It comes with NFC built-in. NFC is a technology that allows for near-instantaneous VR app activation as soon as the phone is placed in the headset. Some of the most interesting things about cardboard VR is its simplicity, the fact that it’s affordable and also it comes with an effective design which made VR Tips Today mention it as one of the best virtual reality headset you can buy in 2018. Remember you also need to download some cardboard vr apps to use for your vr experience. We wrote an article showing How to setup Google Cardboard for Android and you should endeavour to read it as it covers an easy, step-by-step instructions for you to start experiencing Virtual realty on the Go. Google Cardboard’s control comes with a circular magnet on the side, the metal is meant to interact with your phones magnetometer to simulate a button. It also has universal smartphone support. Are you looking for a simple and cheap way to experience VR, then we advice you to go for the Google Cardboard vr headset. But, don’t expect to have that 100% full immersion simply because we said so..lol. 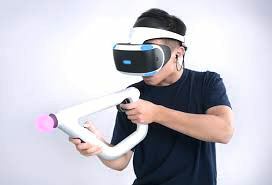 Just hearing the name “PlayStation” makes you feel the VR headset would be cool for gaming. The PlayStation headset known by the codename “Project Morpheus” during development was developed by Sony Interactive Entertainment and was launched October 2016. TechRadar says PSVR is an affordable introduction to quality VR, but many of the experiences aren’t as cool as the ones found in Oculus Rift or HTC Vive. Sony revealed on their blog as at August 2018 that shipped over 3 million PSVR systems, adding that over 21.9 million experiences (games and apps) have been sold along with the headset. A typical PlayStation VR bundle should contain Head, processor unit, earbuds, HDMI cable, USB cable, AC adaptor and Cord, and PSVR headset connection adaptor. So if you are looking for an affordable near PC-quality performance and good selection of games, then VR Tips today advices you to go for the PlayStation Virtual Reality Headset. Why did we include Merge VR in the list of the best VR Headset you can buy in 2018? VR Tips Today included this cool tech due to its compatibility with Android and iOS devices, the Merge VR Goggles unlock immersive virtual reality experiences, powered by a user’s smartphone. What is the best VR headset for iPhone? Merge VR is the answer for iPhone users. So you could be one of the guys on the iPhone side and considering the fact that Apple hasn’t released its own version of VR headset and you also want to experience this cool VR immersion, the we advice you to go for the Merge VR. 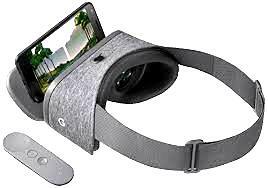 As the name implies, Google Daydream is a Virtual Reality (VR) platform developed by Google built into the android mobile operating system versions Nougat 7.1 and above. 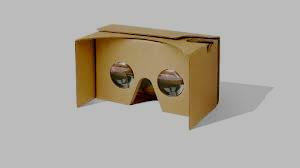 To be plain, it just seems as the elder brother to the Google Cardboard, we talked about earlier on. What is cool about the Google Daydream View? We realized that the VR headset is aggressively priced, has a cool and comfortable design (even a grandma would be comfortable with it), not some sort of a gigantic monster looking device wrapped on my face. Google Daydream View has a growing content library with original content and unarguably has accurate and intuitive controllers. The problem with Google Daydream View is that it lacks integrated audio and no voice command. Many gamers love the Samsung Gear VR with controllers and I am sure you would too. Its compatibility goes with several generations of Samsung’s phones, from the S6 and later which provides many ways for its users to get a VR hit, I know VR nerds love this! Unlike the Google Daydream View that con forms to Google’s minimum speculations, the Gear VR is locked to Samsung devices which entails that the choice of compatible headsets is fairly limited. If you are interested in VR and are looking for a new smartphone, then the Gear VR should be a sufficient reason to turn your head to Samsung’s way. 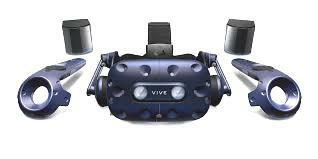 The HTC Vive headset was developed by HTC and Valve Corporation and it is famous for using room scale tracking technology, which allows a user to move in 3D space and use motion-tracked handheld controllers to interact with the environment. What is the content of a typical HTC Vive Box? In a typical HTC Vive Box you will find Vive HMD with integrated Camera and mic, base station for tracking (2), base station mounting kits (2), Link Box, in-ear stereo headphones with 30 cm cord, 3m base station power adapter (2), 1.2m Link Box power adapter, Cables and Controls, the size of HTC Vive is roughly 563g. The HTC Vive headset is incredible, having intuitive controllers with good battery life, solid selection of games already available and its bad sides include being quite expensive and its space requirement: It requires a powerful gaming PC with enough graphics card to play. This made me remember sometime ago when my lecturer told us in a lecture room that the kind of device (PC, mobile Phone) we use can affect how we view the output. This literally means that the stronger your PC, the better your VR experience with HTC Vive or any other vr headset you choose to use. HTC Vive supports games such as Fallout 4, Doom, Rick and Morty. 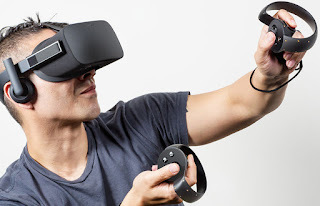 The Facebook owned Virtual Reality headset developed and manufactured by Oculus VR released on March 28, 2016 is a gadget that deserves to be on our list of top VR headset of 2018. Some people may ask “Does Oculus Rift need a Computer to function?” the answer is: SURE...it does. You would require a solid gaming PC to pump out the high frame rate required to make the VR experience enjoyable. 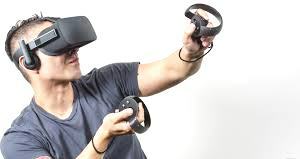 In recent times, Oculus Rift require the Windows 10 OS to run with all new and upcoming features and apps, but folks using Windows 7, 8.1 can still play the existing games while it lasts. The Oculus Rift is easier to setup and that’s a kudos. You can either sit or stand while wearing the headset, whichever you find more comfortable. Unlike, the HTC Vive you may not possibly use the hardware inside the box to actually walk around at all like what we commonly refer to as room-scale VR. The Oculus Rift VR headset has the capability of fully immersing you in virtual worlds but it requires a powerful gaming PC. So from the review you just read above on the best vr headsets of 2018, you would realize that it’s possible to experience virtual reality with a simpler gadget like the Google Cardboard. You can also gain comfort with Google Daydream View or Samsung’s Gear VR powered by Oculus. It is also possible to experience a more powerful and immersive Virtual Reality using the PlayStation VR, Oculus Rift and also the HTC Vive. There are also cool headsets we didn’t talk about in our best vr headset of 2018 review, they include Panasonic VR headset, Oculus Go, Canbor VR Headset, Sarlar 3D VR, Merge VR and Noun Pro. In conclusion, when choosing a virtual reality headset, you have to weigh up three things which include Price, Portability and Performance. Thank you for spending out time to read Virtual Reality Tips Today’s “top vr headsets of 2018”. Hope you found our content useful? If you did, then show us in the comment section below. I think Bluetooth bone conduction headphones are better than the wireless. What you guy say?